This stock dropped in better than the previous stock and was dead centered the full length. I was very nervous about the swap as it is going on a weapon that shoots 1/3 to 1/4 MOA. I haven't loosened one screw on it since I dialed it in. much to my shock it did not affect the accuracy in any way. now to the stock! It is very well made and easily comparable to stocks twice the price. Block inserts were spot on. It has the feel I am personally accustomed to and honestly, it just damn bada$$ to look at. very comfortable to work and the adjustable ergonomics really adds to shooter comfort. If you are thinking about getting one for your weapon I would seriously consider this. 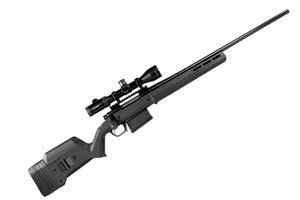 precision shooting or long range hunting, you will not be sorry at all.